Drive/hire a car (automobile) in uk or europe. You may want to buy a car in the UK if you do not live close to your place of work or study, although you might first consider using public transport if it is available. Driving in the UK can be expensive: for example, taxes on petrol are very high. Most students, and many people who live in major cities such as London, do not own a car. To explore the British countryside, some people want to hire a car, because some areas are not served by frequent train and bus services. You must not drive unless you have a driving licence which is valid in the UK. There are different rules for people holding licences from other countries: you should check requirements before you travel to the UK. The rules are summarised in the UKCISA guidance notes on "Driving in Great Britain: a guide for international students", see: http://www.ukcisa.org.uk/student/information_sheets.php. Licences issued in other EEA (European Economic Area) countries can normally be used within the UK. If you come from outside the EEA, you may be able to drive for up to 12 months if you obtain an international driving permit before coming to the UK, or if you are already in the UK you may be able to exchange the licence obtained in your country for a British one (Japanese students may need to obtain an official translation from their embassy). If you are frm outside the EEA and you stay in the UK for more than 12 months, you will normally need to take a driving test to obtain a UK driving licence. For further information, see the website of the DVLA (Driver and Vehicle Licensing Agency): http://www.dvla.gov.uk. section and choose Motors then Self drive then Car rental. The companies which are closest will be listed first. section and choose Motors then Car parking & garaging. The car parks which are closest will be listed first. You cannot park your car on a road which has double yellow lines or double red lines (two yellow or red lines along the side of the road). If there is a single yellow line, parking may be allowed at some times (there will be a sign nearby explaining the rules). In many residential areas in the centre of cities, parking may be for local residents only, or you may need to display a parking permit on your windscreen. Some areas have parking meters, which allow you to pay to park there for a short time (for example: 2 hours). You are not supposed to keep adding money to a parking meter to stay for a longer time, although some people do this. Traffic wardens often check that parking rules are being followed. If you are breaking the rules, you may be given a parking fine. In some cases your car may be wheel-clamped, which means that large locks will be added to the wheels of your car. You have to pay a fine and arrange for the wheel-clamp to be removed (a process that may take several hours) before you can drive your car away. In the UK cars drive on the left-hand side of the road, and the steering-wheel in cars in therefore on the right-hand side. Although it is allowed to drive a car in which the steering-wheel is on the left, you should be very careful if you do this. If there is a pedestrian crossing across the road (marked using black and white stripes across the road, and round orange lights on either side of the road), you must stop your car if someone is wanting to cross. Similar types of crossing which are controlled with traffic lights (which change after a pedestrian has pressed a button) are known as pelican crossings. 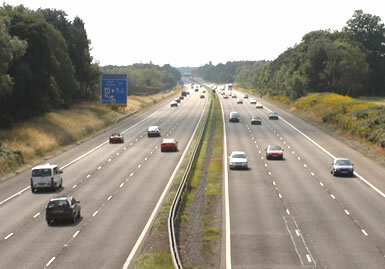 There is quite an extensive system of motorways which usually allow you to travel quickly between major cities (the ones around London can be very busy). Most have three main lanes, plus a lane on the left (known as the hard shoulder) where you can stop in an emergency. The speed limit is usually 70 miles per hour, although lower limits are sometimes shown using signs above the road. The lane on the left is the slowest lane, and is often used by large vehicles or smaller cars with less powerful engines. The lane on the right is supposed to be used only for overtaking - you should move back to a slower lane as soon as possible. There are tolls (charges) for crossing some bridges, but there are usually no motorway charges in the UK. The Highway Code sets out the rules for driving in the UK. If you take a driving test in the UK you will be asked questions about these rules. If you have an international driving licence you may still want to review this book before driving in the UK. Roads in central London are very busy, driving can be very slow, and parking can be difficult and expensive. It can also be quite complicated to find your way around if you do not know the roads. Try to avoid taking a car into central London and use public transport instead (for details of London Transport, see: Travel/Transport/London; for details of train travel into London, see: Travel/Transport/Train; for details of how to use taxis, see: Travel/Transport/Taxi). 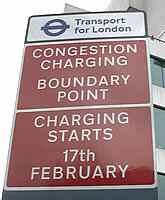 Congestion charging was introduced in central London in February 2003. If you drive within the Central London congestion charging zone between 7am and 6pm (before February 2007 it was 6:30pm) between Monday and Friday (except on public holidays and during the period between Christmas and New Year), you need to pay the daily charge (from 4 July 2005 this is £8) before midnight on the same day. You can pay at many newsagents, shops, petrol stations or car parks, or by telephone or on the internet (assuming that you have a credit card or debit card). You can also pay on the next charging day (if you drove into the zone on Friday, this would be the following Monday) using the website or call centre only, but the charge rises (from 4 July 2005 this is £10). 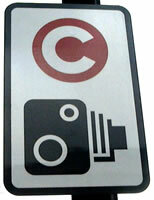 If you do not pay before the end of the following day and the roadside cameras have photographed your car's numberplate, you will be sent a Penalty Charge Notice and will have to pay much more (£100, reduced to £50 if paid within 2 weeks or increased to £150 if not paid within a month). There are no road barriers, but you will know that you have entered the charging zone when you pass signs like those shown below. For details, see: http://www.cclondon.com. 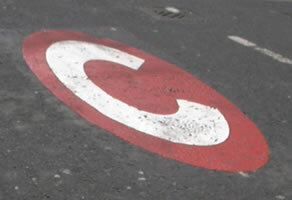 From 19 February 2007 the congestion charging zone is being extended further to the west, to include most of Pimlico, Belgravia, Brompton, Knightsbridge, Bayswater, South Kensington, Kensington, Notting Hill and North Kensington. A few roads passing through the new extended zone will not have a charge: these are the roads on the western side of the previous congestion zone (Edgware Road, Park Lane, Grosvenor Place, Vauxhall Bridge Road) and the A40 (Westway). Note that if you live within the charging zone (or in some neighbouring areas) you can obtain a residents' discount. The western extension of the congestion zone will be scrapped in 2010. To find out details of car ferry services from the UK to Europe, see: Travel/Transport/Ferry. Eurotunnel carries passengers and cars between Folkestone (UK) and Calais (France): http://www.eurotunnel.co.uk. The train is called Le Shuttle. The journey (through the Channel Tunnel) takes about 35 minutes.